One of the best things about the yard and gardens is enjoying the birds that are frequent visitors. Attracting birds is easy if you provide basic necessities including food, water, shelter and nesting places. Birds need a diversity of trees and shrubs, especially evergreens, so that they can hide from predators and seek shelter from weather. These same trees and shrubs provide nesting spots for birds that make open nests, such as robins, cardinals and finches. Other birds appreciate birdhouses. A wide selection of wooden houses in various sizes and shapes, with special openings for cleaning purposes are available. 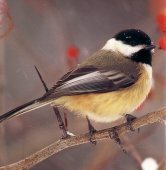 Choose houses with smaller openings for chickadees and wrens, medium-sized openings for sparrows, finches and bluebirds, and larger openings for woodpeckers. It is important to place the birdhouses away from the activity of feeders and birdbaths – and where they will get some shade in the heat of the day. Bird feeders dramatically increase the number of birds in your garden. Start with a hopper-type feeder filled with black oil sunflower seed. This combination attracts the widest variety of birds, including cardinals, chickadees, titmice, nuthatches, blue jays, finches, doves and sparrows. If squirrels are a problem, use pure safflower seed instead of sunflower. The birds still like this food but squirrels will not eat it. 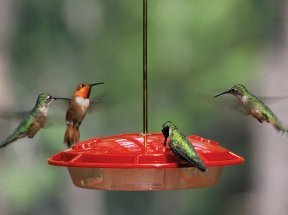 You can add additional feeders depending on what kind of birds you want to attract. A tube feeder with Nyjer® seed (commonly called “thistle”) attracts bright yellow goldfinches, pine siskins, and other small finches. My favorite is the Droll Yankee® Peanut Feeder, a tube of metal mesh sized to hold peanut mixes. Woodpeckers, chickadees, titmice, nuthatches and blue jays visit in greater abundance when my peanut feeder is full. Suet is also attractive to woodpeckers, and sometimes even robins and bluebirds. A simple tray- or platform-type feeder is also excellent for offering bits of fruit or mealworms to bluebirds, robins, orioles, and mockingbirds. The hummingbird, found in Missouri from mid-April through mid-October, enjoys nectar. There are many sizes and shapes of hummingbird feeders, and all work well. Nectar will spoil if left out for more than a week, so select feeders that are small enough for the birds to use up within a few days. Orioles also feed on nectar, but due to their larger size, you might want to use a feeder designed especially for them. Water is a critical need and will attract all kinds of birds. A birdbath or a simple dish or saucer will provide a place for drinking and bathing. Be sure to change the water in the birdbath at least once per week. The Water Wiggler®, available at Hillermann’s, produces ripples in the birdbath making it more visually attractive to birds and discourages mosquitoes. In the winter, it is much harder for birds to find water than it is to find food. An electric birdbath heater solves this problem by keeping water partially ice free. There is no danger of shock, and the heater shuts off automatically when it reaches 40 degrees, so it is both safe and energy efficient. As you can see, attracting and feeding birds is quite easy, and can be as simple or complex as you would like to make it. It also gives us another reason to keep our minds on the outdoors during the cooler months of the year. Discover for yourself that wild birds truly add life to a garden every day of the year.